The practical design and simple construction of this wooden pen, from renewable cedar forests, has made it an advertising favorite. 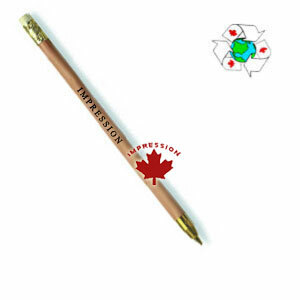 One gets the comfort and feel of a cedar pencil with the smooth writing of a carbide ballpoint pen. Price includes the same one (non-metallic) imprint on all pencils. 1 Colour imprint included $1.15 $1.10 $1.05 $1.00 each. The above prices include one common printed logo or message on the pens. The printing ink used meets California environmental standards.